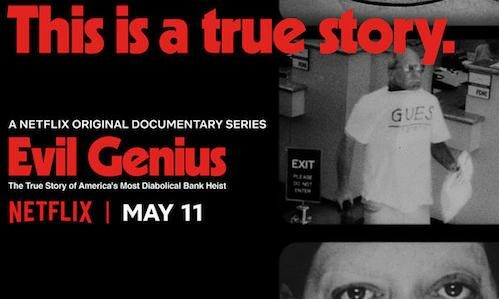 Evil Genius is another well done true crime docuseries. The film revolves around the collar-bomb murder of Pizza deliveryman Brian Wells in Erie, Pennsylvania in 2003. Who was behind the crime, which also involved a bank robbery? Was Brian Wells in on it? The filmmakers take a methodical approach examining the case through a series of interviews and news footage. The first episode involves the bank robbery and murder of Brian Wells. In the second episode we meet the people behind this and other crimes. The Evil Genius in the title refers to Marjorie Diehl-Armstrong, a psychopath who is also bi-polar. She and her one-time boyfriend, Bill Rothstein, spend a lot of time talking about how smart they are. But looking at how they lived, you would have a hard time making a case for their intelligence. Once the police get one of the co-conspirators to confess, a clearer picture emerges. The prosecutor eventually names six people, including Brian Wells and another pizza deliveryman who died of a drug overdose days after Wells’s murder. One question that bothered me from the very first time I heard it was the question of Brian Wells’ involvement. If he was involved, why would he agree to place a live bomb around his neck? The answer emerges in the final minutes of the last episode.